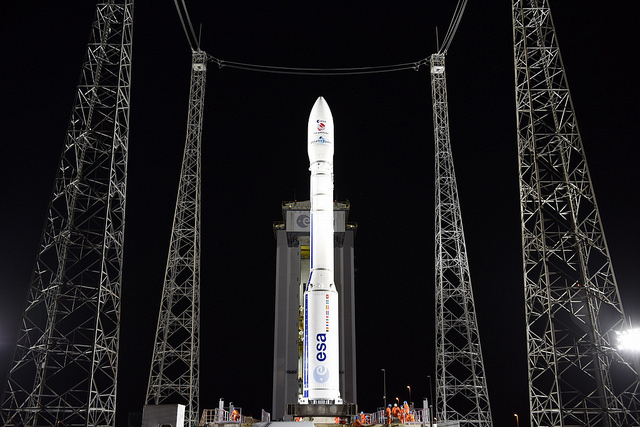 The overall number of launches scheduled in 2016 is one less than the flight rate Arianespace achieved in 2015, but if the company launches eight Ariane 5 rockets, it will set a new record for Europe’s workhorse rocket. Arianespace is coming off a year with 12 launches, including six flights of the Ariane 5, and three missions each by the medium-lift Soyuz rocket and the light-class Vega booster. That met the company’s launch forecast released in January 2015. “What we said here in January last year, we realized in December, and you can check, this is quite rare in our profession,” said Stephane Israel, Arianespace’s chairman and CEO. The Ariane 5 lifted 11 communications satellites and one European weather observatory into geostationary transfer orbit on its six missions in 2015, a total mass of about 53 metric tons, or more than 115,000 pounds. Israel told reporters Jan. 5 that Arianespace logged more than 2.5 billion euros ($2.7 billion) in launch orders last year, new business that represents 33 launches, including 21 Soyuz flights for OneWeb, a space startup aiming to deploy a constellation of hundreds of satellites in low Earth orbit to beam global broadband Internet services. Last year’s sales numbers totaled 1.4 billion euros ($1.5 billion), a record for the French launch services company. Arianespace also received new contracts last year for the equivalent of eight Ariane 5 launches, including the dedicated launch of the James Webb Space Telescope, the successor to Hubble, in 2018. At the end of the year, Israel said Arianespace’s total backlog stood at 5.3 billion euros ($5.8 billion) — about 75 percent for commercial customers and 25 percent for government clients. In terms of launches, that represents 58 liftoffs under contract by Arianespace: 25 Soyuz, 24 Ariane 5 and nine Vega missions. Arianespace’s launch calendar this year begins Jan. 27 with the blastoff of an Ariane 5 rocket with Intelsat 29e, the first of Intelsat’s “Epic” series of communications satellites equipped with high-tech digital payloads offering higher throughput capacities for broadband applications. 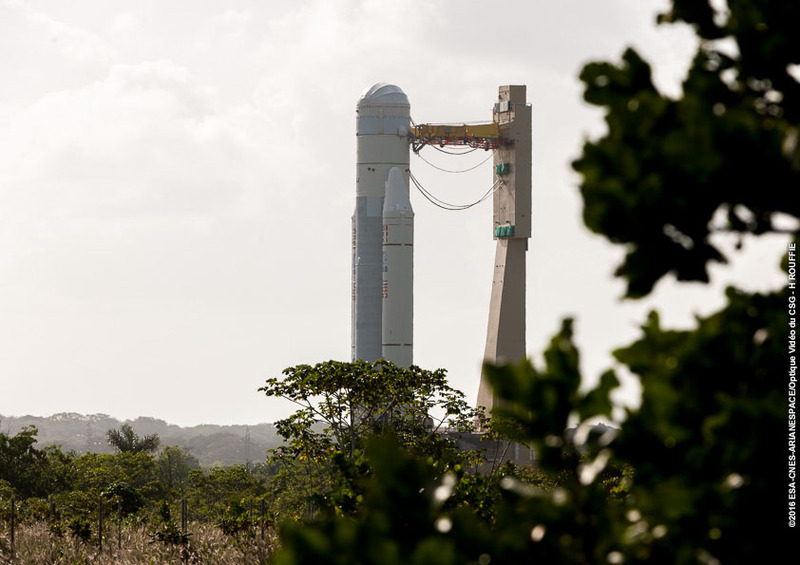 Another Ariane 5 flight is tentatively set for March 9 with the Eutelsat 65 West A telecom platform, a multipurpose satellite with video, television and Internet broadcasting missions over Latin America. The first two Ariane 5 launches of the year will haul single satellites into geostationary transfer orbit, the drop-off point for communications craft heading for the geostationary arc nearly 36,000 kilometers (22,300 miles) over the equator. Ariane 5s typically carry one large and one smaller communications satellite in upper and lower slots inside the payload shroud on each mission, allowing the customers to share the cost of the launch. 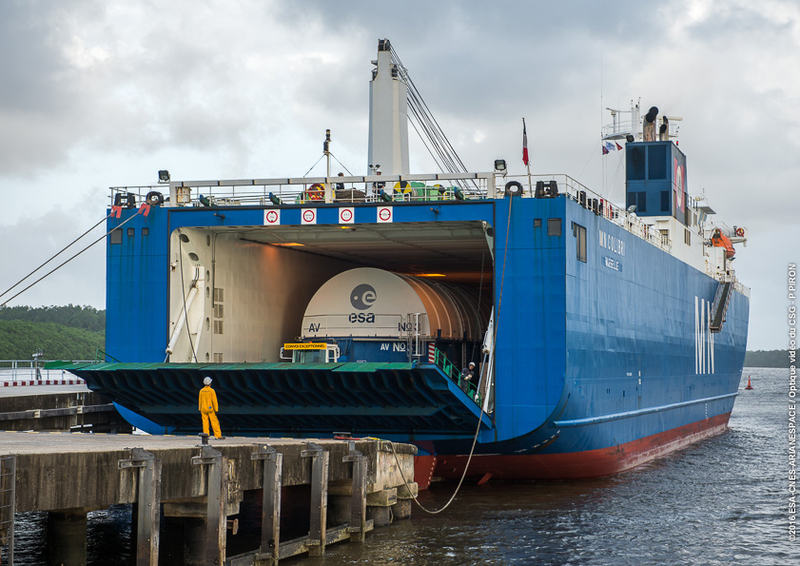 But Arianespace says no co-passengers were available to ride in the lower slot with Intelsat 29e and Eutelsat 65 West A until at mid-2016. Intelsat and Eutelsat officials said they elected to pay extra for the dedicated rides, citing the “Epic” program’s critical importance for Washington-based Intelsat and the desire to have Eutelsat 65 West A operational in time for the Olympics in Brazil in August. 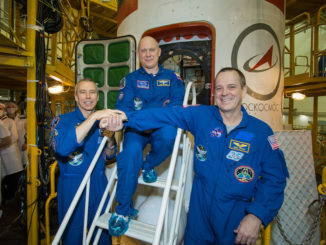 Arianespace’s third flight of the year is set for April 12, when a Soyuz rocket will loft the European Commission’s Sentinel 1B Earth observation satellite. Sentinel 1B is the second radar imaging craft in Europe’s Copernicus Earth observation program. Secondary satellites for the French space agency CNES, Norway and a CubeSat sponsored by the European Space Agency will accompany Sentinel 1B into space on Arianespace’s sole Soyuz launch of 2016. The third Ariane 5 launch of the year is scheduled for May with the EchoStar 18 and BRIsat communications satellites. EchoStar 18 will provide direct-to-home television broadcast services over North America for EchoStar and Dish Network. BRIsat will support banking services provided by BRI, a large Indonesian bank. Five more Ariane 5 flights are due before the end of the year, including the October launch of a quartet of navigation satellites for Europe’s Galileo system, an analog to the U.S. military GPS network. That flight will mark the Ariane 5’s first flight to deploy Galileo satellites, following a sequence of Soyuz launches that flew with two Galileo spacecraft at a time. Arianespace has not finalized and disclosed payload pairings for the other four Ariane 5 launches in 2016. Other payloads that are candidates to launch on Ariane 5 rockets this year include two satellites for Intelsat — the second Intelsat Epic series satellite, Intelsat 32e, and the Intelsat 36 television broadcasting craft. The JCSAT 15 communications satellite for Japan’s SKY Perfect JSAT Corp., the second satellite for Australia’s national broadband network, India’s GSAT 16 telecommunications spacecraft, the Telkom 3S video and Internet services platform for Indonesia’s PT Telkom communications provider, and the Star One D1 telecom satellite for Brazilian satellite operator Embratel Star One are also expected to be ready for launch this year. The Hispasat AG1 satellite, built on a new medium-class satellite bus funded by the European Space Agency, is also on track for an Ariane 5 launch in the fourth quarter of 2016, according to ESA. The Koreasat 7 communications satellite, designed to cover South Korea and South Asia, is expected to launch by the end of the year on an Ariane 5 rocket, according to its owner, KTsat. Japan’s DSN 1 military telecom station and the Al Yah 3 broadband satellite for African and Brazilian markets could also be ready for liftoff in 2016. Two Vega rockets are on Arianespace’s manifest this year. The solid-fueled launcher will soar into orbit in July with the PeruSat 1 surveillance satellite for the Peruvian government and four high-resolution commercial imaging satellites for Google’s Skybox Imaging. In late 2016, another Vega rocket will deploy the Gokturk 1A Earth observing craft for the Turkish defense ministry. Fewer Vega and Soyuz launches are planned this year than occurred in 2015, but Israel said their launch rates will ramp up in 2018 and 2019. Arianespace says it expects an average of six Ariane 5 flights, three Soyuz launches and three Vega missions per year, the exact result of last year’s launch campaign. 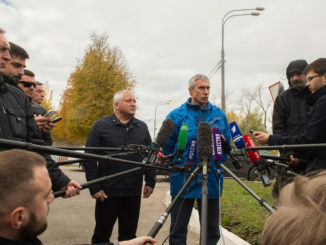 In his annual press conference, Israel said Arianespace sees strong competition from SpaceX and International Launch Services, which markets the Russian Proton rocket for commercial satellite deliveries. Despite the Proton’s checkered reliability record in recent years, ILS still has a foothold in the launch market thanks to price cuts Israel claimed undercuts some SpaceX contract bids, which are relatively inexpensive compared to many other launch industry participants. Arianespace says it also reduced prices for small satellites riding on Ariane 5 in response to increased competition with SpaceX, and the company is also reducing operating costs, Israel said. Communications satellite owners have repeatedly said they want three viable commercial rockets to choose from when buying launch services to avoid surging prices and to cushion the impact of one launcher being grounded due to failure. The Ariane 6 rocket, set for its debut launch by the end of 2020, is designed to launch two communications satellites for half the cost of the Ariane 5. Officials presume the Ariane 6 will fly up to 12 times per year, with commitments form European institutional entities like the European Space Agency to fly on the rocket five times annually. Arianespace will try to sell the rest of the manifest on the commercial market. Israel said the initial financial results indicated 2015 was a breakeven year for Arianespace, accounting for approximately 100 million euros ($108 million) in support payments from European governments. Financial support from European member states will cease when the Ariane 6 is operational. Echoing statements made by other rocket industry officials in the United States, Europe and elsewhere, Israel questioned the technical and economic case for reusability after SpaceX’s dramatic rocket landing experiment at Cape Canaveral last month. 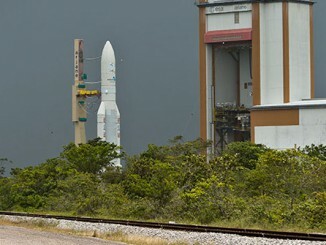 Israel said the Ariane 5 rocket is usually launched at full capacity, and cannot afford performance losses inherent in using leftover fuel to steer the booster to a controlled landing. The payoff of a reusable rocket is only possible if the launcher is flown many times, and market outlooks in the commercial sector and with European institutional missions do not add up to tip the scales in favor of reuse, he said. For European governments, who are paying most of the bill for the development of Ariane 6, an independent, all-European pathway to space is paramount, but the rocket needs additional commercial missions to realize economics of scale. European officials continue to enthusiastically back the Ariane 6 rocket, which in its dual-payload configuration should be priced on par with SpaceX’s current Falcon 9 prices, and less than the advertised rate to buy a Falcon Heavy flight. Those SpaceX prices do not assume reusability, and it is not yet clear when SpaceX might fly a Falcon 9 first stage again, or how much cost savings reuse could eventually realize. Other launchers could be active in the commercial market by 2020, including Japan’s new H-3 rocket, the Russian Angara booster, India’s GSLV, and United Launch Alliance’s Vulcan vehicle. Israel said Europe “must not deviate one iota” from the launcher strategy outlined in late 2014, in which control of the Ariane 6’s design transferred from the French space agency CNES to industry under a new joint venture called Airbus Safran Launchers.